April showers bring spring flowers. They can also cause wet rot on your homes exterior wood surfaces. 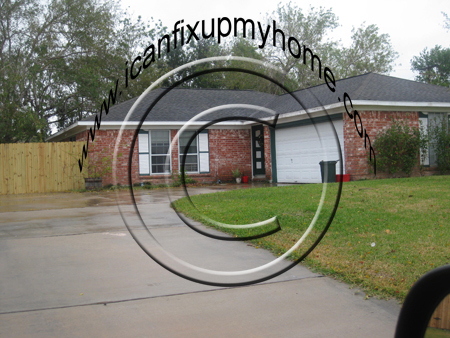 This could be fascia boards, entry door thresholds and jambs, and wood garage doors and trim. During your annual inspection, take time to examine the weatherstripping as well. A visual inspection is a basic method of detecting moisture retention damage. What should you look for? Bubbling paint or spot paint chip flaking tells you that something bad is happening beneath the surface, making your paint lose its bond. Unfortunately, a visual inspection is less than conclusive. Next use an awl or a nail to lightly probe the wooden surface for any evidence of softness. One good thing; this test is great since any damage you find indicates that your damage is still very limited at this time. Also, be aware of rotten wood that is associated with a white-colored powdery fungus. This is an indication of a specific problem known as dry rot. You can usually treat this with strong fungicides to keep the growth from spreading further. If you catch it early on, treatment is simpler and much less invasive. The basic idea is to dig or scrape out the softened wood completely. Next, drill holes into the wood area. Insert fungicidal rods (these are similar-looking to wood dowels) along with borate preservatives. Next, use your putty knife to fill the void using a high-quality epoxy wood filler. Note that this step may have to be repeated. Once it is completely cured and dry, sand it down. Prime it with an epoxy sealer. Finally, paint it to match. You will likely have to paint the the entire window frame or sill for two reasons; first, for a good color match and secondly, because it is just a prudent maintenance effort as long as you are there. When your problem is too far gone to treat minimally as outlined above, dont panic, but you will have to resort to some good old-fashioned surgery. Your damaged wood will have to be cut out. Do this a bit past the point where you encounter dry, solid wood. The tools youll need will depend on your circumstances, but Ive had luck with an electric jigsaw, hammer and chisel, coping saw, and even my Roto-Zip rotary tool. When dealing with door frames or jambs, your moisture damage is probably going to happen down low. The piece of wood that you cut out needs be shaped like a step. This is to ensure maximum open grain (for bonding) and support. When you find yourself fixing damaged window sills (this is the the horizontal piece of wood extending from the bottom of your window), you should see a drip groove on the underside of it. This is there to let rain water drop to the ground rather than traveling to the home itself. Clever. Youll have to replicate this groove with a patch. You will probably need to use your chisel and hammer or a router for this job. Usually its a simple matter to cut and apply a wood patch. If you need to, you can cut it a bit larger to start and then fine-tune it, with a process of dry-fitting and altering. Once youve got it just right, secure your patch with either brass or stainless steel wood screws after pre-drilling the holes to prevent wood splitting. Finally, finish it all off as explained in the minimal damage section above.